Daryl Millard will be back to haunt St Helens in the World Club Challenge after being named in South Sydney’s 20-strong squad. The Fiji international signed a 12-month contract with the reigning NRL champions following his release by Catalans Dragons at the end last season, and was in the Rabbitohs party that flew out of Sydney on Sunday. It was Millard who scored a famous try to condemn Saints to a 34-32 defeat at Langtree Park two years ago, almost to the day, in one of the most gripping finishes to a match in Super League history. The Dragons trailed 32-28 with time up on the clock when the ball went through 11 sets of improvised kicks and passes in the last move of the match to enable Millard to cross at the corner. That tied the scores and Scott Dureau landed a touchline conversion to break Saints’ hearts. Millard, who turns 30 on Friday, made 113 Super League appearances for Wakefield Trinity Wildcats and Catalans but was not offered a new deal by the Dragons as they made room on their overseas quota for the arrival of Todd Carney. The former Canterbury Bulldogs and St George Illawarra threequarter is joined in the Souths squad by England forwards Tom and George Burgess, who are among 11 members of the team that beat the Bulldogs 30-6 in the NRL Grand Final last October. The squad, led by Australia full-back Greg Inglis, also includes new recruits Tim Grant and Glenn Stewart as well as deposed captain John Sutton, but forward Kyle Turner is an absentee after being hospitalised with a neck injury sustained during the season-opening NRL All Stars match on Friday. 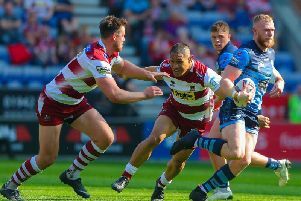 Souths, coached by former Wigan Warriors boss Michael Maguire, fly into Manchester Airport on Monday afternoon to begin their preparations for the clash with Saints at a sold-out Langtree Park on Sunday. South Sydney squad: George Burgess, Tom Burgess, Jason Clark, Bryson Goodwin, Tim Grant, Chris Grevsmuhl, Greg Inglis (captain), Alex Johnston, Luke Keary, Ben Lowe, Issac Luke, Cameron McInnes, Chris McQueen, Daryl Millard, Joel Reddy, Adam Reynolds, Glenn Stewart, John Sutton, David Tyrrell, Dylan Walker.